Use this deed to convey property from grantor to grantee and to establish ownership in perpetuity. In Washington, D.C., "every conveyance or devise of real estate shall be construed and held to pass a fee simple estate or other entire estate of the grantor or testator, unless a contrary intention shall appear by express terms or be necessarily implied therein" (D.C. Code 42-701). The fee simple deed is used to convey property from one person to another. According to Black's Law Dictionary (8th ed. ), a fee simple deed creates the broadest property interest allowed by U.S. law. Property owned in fee simple is owned in perpetuity, until the current holder of the property dies without heirs. A property held in fee simple does not have to include words of inheritance to differentiate it from a life estate; in the event of death, a fee simple property passes to any and all heirs, unless otherwise stated in the form of the deed. 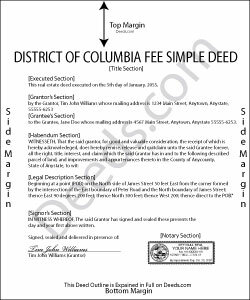 There are two types of fee simple ownership under D.C. Code 42-503: absolute and qualified. A property in fee simple absolute allows the holder the unconditional power to use, sell, lease, or will the property as he/she sees fit. A property in fee simple qualified contains specific language, such as a durational or conditional statement, which defines the use of the property.